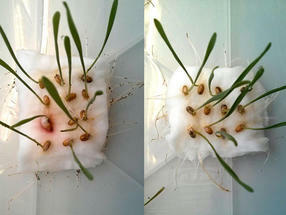 If aphids have the choice between wheat seedlings with (right) and without CBT-ol treatment (left), they avoid the treated seedlings. 08-Jun-2018: Traditional insecticides are killers: they not only kill pests, they also endanger bees and other beneficial insects, as well as affecting biodiversity in soils, lakes, rivers and seas. A team from the Technical University of Munich (TUM) has now developed an alternative: A biodegradable agent that keeps pests at bay without poisoning them. "It's not just about the bees, it's about the survival of humanity," says Professor Thomas Brück, who heads the Werner Siemens Chair of Synthetic Biotechnology at TU Munich. "Without the bees that pollinate a wide variety of plants, not only would our supermarket shelves be quite bare, but within a short time, it would no longer be possible to supply the world's population with food." Synthetically produced insecticides endanger not only bees but also beetles, butterflies and grasshoppers. They affect biodiversity in soils, lakes, rivers and seas. Their use has consequently been highly controversial for many years. Brück and his team have now found an alternative: The insect repellent they have developed is biodegradable and ecologically harmless. Sprayed on plants, it works much like mosquito repellent used by bathers in the summer, spreading a smell that keeps away unwanted insects. "With our approach, we are opening the door to a fundamental change in crop protection," says Brück. "Instead of spraying poison, which inevitably also endangers useful species, we deliberately merely aggravate the pests." The Munich researchers were inspired by the tobacco plant, which produces cembratrienol in its leaves, CBTol for short. The plant uses this molecule to protect itself from pests. Using synthetic biotechnology tools, Professor Brück's team isolated the sections of the tobacco plant genome responsible for the formation of the CBTol molecules. They then built these into the genome of coli bacteria. Fed with wheat bran, a by-product from grain mills, the genetically modified bacteria now produce the desired active agent. "The key challenge during production was to separate the active ingredients from the nutrient solution at the end of the process," explains Mirjana Minceva, Professor of Biothermodynamics at the TUM Weihenstephan Campus. The solution was centrifugal separation chromatography: a highly efficient process that works equally well on an industrial scale, but hitherto, had never been used to separate products from fermentation processes. Initial investigations indicate that the CBTol spray is non-toxic to insects, yet still protects against aphids. Since it is biodegradable, it does not accumulate. In addition, the bioactivity tests showed that cembratrienol has an antibacterial effect on gram-positive bacteria. It can thus be used as a disinfectant spray that acts specifically against pathogens such as Staphylococcus aureus (MRSA pathogen), Streptococcus pneumoniae (pneumonia pathogen) or Listeria monocytogenes (listeriosis pathogen).